To make the frame, twist together the ends of the wire to form one large loop. Keeping the wire flat, pinch the middle together. Mould each side into an ear, forming two petal shapes in a figure of eight. Fold the fabric in half with wrong sides facing. Sandwich the wire frame in between the fabric. Pin in place. Trim any excess fabric along the open edges, leaving a 3cm seam allowance. Tuck in the seam allowance and pin stretch the fabric taut but do not pull the frame out of shape. Machine stitch around the outer edges. To attach the ears to the headband, fold the ears in half at the central point so both are facing foward. 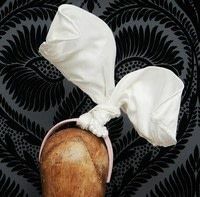 Feed the headband in between and wrap the back ear around the front ear to make a knot. Check that the ears are securely fixed and will not move around when worn. Curve the ear tips inwards. For the pearl decoration, cut a 20cm length of wire and thread on the pearlescent beads. Tuck into the ear knot and twist the ends of the wire together. This entry was posted in Costume Ideas by ybyatt. Bookmark the permalink.